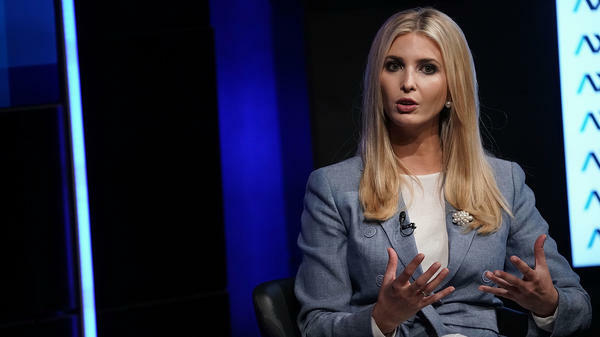 Ivanka Trump, White House adviser and daughter of President Trump, speaks during an Axios360 News Shapers event Thursday at the Newseum in Washington, D.C.
"That was a low point for me as well," she said. "I feel very strongly about that. And I am very vehemently against family separation and the separation of parents and children." Trump also called illegal immigration an "incredibly complex" topic, and said that her mother, Ivana Trump, was an immigrant who came to the United States legally from a communist country. She added that "we have to be careful about incentivizing behavior that puts children at risk," by encouraging dangerous journeys across the border. "These are not easy issues; these are incredibly difficult issues," she said. "And like the rest of the country, I experience them in a very emotional way." In a tweet in June, Trump thanked her father for signing an executive order aimed at ending the separations brought about by his "zero tolerance" policy on illegal crossings on the southern U.S. border. Echoing statements by her father, she also called on Congress to take steps to reform the immigration system. It's previously been reported that Ivanka Trump and first lady Melania Trump put pressure on the president to end the separation of families. The first lady has made two visits to immigration facilities to meet with children separated from their parents, with immigration officials and with the organizations tasked by the government with caring for the separated children. The federal government said it had reunited all "eligible" children and parents in an effort to comply with a court-ordered deadline last week. But hundreds of children still remained in federal custody as of the June 26 deadline, and the Trump administration continues to face tough criticism over the policy and its impact on children.